Capitalizing on our rich industry experience of 19 years, we have established ourselves as a prominent manufacturer, supplier, wholesaler and exporter of Ropes & Twines. Our range encompasses Rope, HDPE Rope, Packing Rope, Mono Filament Rope, PP Rope, Plastic Rope, Mono Filament Rope, PP Rope, PP Baler Twines and Cotton Rope. 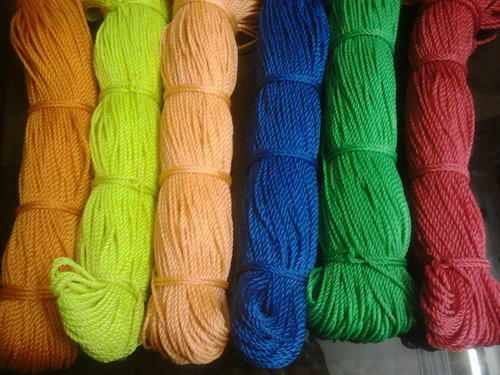 Apart from these, we also offer Cotton Rope, Polyester Color Tape, Cotton Tape and Packing Color Twine. Manufactured as per international quality standards, our wide assortment is appreciated for its high strength and excellent load bearing qualities. Our skilled workforce works in sync with the clients so as to properly comprehend their requirements and needs. The products offered by us are fabricated at our well facilitated manufacturing unit, keeping in mind the varied specifications given by our patrons. Finished range is thoroughly tested with the help of the requisite tools and techniques on varied parameters in our in-house quality testing unit. Furthermore, after being tested, the products are safely stored and delivered to the clients within the stipulated time period. Owing to our quality orientation, high client responsiveness and honest policies, we have attained a huge client base spread across the Indian Subcontinent, South/West Africa and the Middle East.